Kids grow up very fast these days. The age of innocence and fun seems to pass in a blur. All kids like to party however. So, if we promise not to make it too slushy for the boys, we have put together some great Valentines Day party ideas especially for the younger generation. Well it probably has to be some kind of variation on a heart. Cut out of card or construction paper. All the party details on the back. You might like to attach a loveheart sweet. The invite could also include some heart shaped confetti which will flutter out on opening. Start with a large heart on the door to your venue. Inside stick with a red and white colour-scheme for your balloons, streamers and ribbons. ..........."As if firing little arrows of love at all your guests! The party table too should be covered in a red tablecloth with heart shaped confetti scattered over it. Attach a balloon to the chairs perhaps with a heart shaped paper message or loveheart sweet inside (insert before inflating). These can be popped later to reveal the messages. Red roses make a good centrepiece and could become a gift for all the guests to take home at the end of the party. Valentine Party Food As much of the food as possible should be cut into heart shapes. For instance a heart shaped cookie cutter can be used not only for heart shaped biscuits but also for cutting sandwiches etc. It is also possible to cut slabs of jelly (made / set in a shallow baking tray) and ice cream (probably strawberry or raspberry ripple) into neat heart shapes too. Small cup-cakes with loveheart messages in the icing are a neat idea. Strawberries dipped in chocolate are another little Valentine treat sure to meet with approval. Valentine Punch can be made from any combination of juice and fizzy drink you are happy with. Add apple slices cut into heart shapes and ice cubes from a heart shaped tray to add to the Valentine theme. Valentine party games are not difficult to come up with. You can simply give many of the old classics a Valentine twist. This is pretty much like normal musical chairs except the kids are in pairs. Have them dance around a set number of chairs or cushions on the floor. When the music stops they have to dash to sit either side by side or on each other's lap. Any couple that can't find a chair is out. For extra excitement you could have them dance around the chairs on opposite sides of the room leading to an even madder scramble when the music stops. Kids party games do not have to be that sophisticated to be lots of fun. This is like musical statues. The kids dance around and when the music stops have to freeze. Anyone who moves is out. The twist is they have to freeze and remain still in a way that you tell them. Tip: You may like to demonstrate suitable poses! Getting back together again and having another big sloppy kiss! This is a Valentine version of pin the tail on the donkey. Design a picture of a couple in love. With a heart shaped bullseye between them. Guests are blindfolded in turn and have to pin their "Cupid' s Arrow" on the picture. Tip: Small heart shaped stickers are an easier alternative to pins. This party game seems a bit simple but it is always really popular with kids. A long length of string. Everyone sits in a circle. The rings are threaded on the string which is then tied in a loop big enough for everyone in the circle to hold it. It should be reasonably taut. One person - The Searcher is chosen to sit in the middle. Everyone else holds the string with both hands (backs of their hands upwards as if you were riding a motorbike is best). The rings are passed around the circle on the string hidden from The Searcher by people's hands. Plenty of diversionary pretend passing should be carried out to throw The Searcher off the scent. The searcher is allowed 3 guesses to find a hand that holds a ring in it. Tip: There is a tendency amongst the kids to hold on to the rings and not pass them around the string circle. Make sure everyone plays properly. An incentive could be a small sweet for every player at the end of each round except those holding a ring. 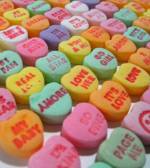 Kids Valentine Party Ideas - Don't Break My Heart....Or Pop It! Divide the children into two teams and partner them up. Each couple in turn must face each other and put their hands behind their backs. The balloon is then inserted between them so that they hold it in place with their chests. They then have to complete a course, made as long and as complicated as you think appropriate, with the balloon pressed between them. If the balloon comes out they must start again. Run as a simple relay race - first team to finish wins. Kids Valentine Party Ideas - Who Stole My Heart? The children sit in a circle around a stool. One child is blindfolded and sits on the stool with the heart on the floor beneath him. One child is silently picked and quietly has to steal the heart and return to their place in the circle and sit on it. 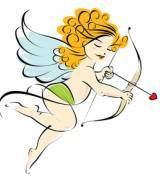 Cupid came and shot his dart? Little Boy / Girl. Little Boy / Girl Where's your heart? The child in the middle then removes the blindfold and has 3 guesses who has stolen their heart. Do you have any great Kids Valentine Party Ideas? Please tell us about what you did at your party. We will add all the best ideas to these pages.